The Cast of the 'Power Rangers' reboot stops by the Fandango Studio at #SDCC to talk about their upcoming film and play Heads Up. Mom's Movie Minute: Is ‘Power Rangers’ Too Scary For Your 7-Year-Old? 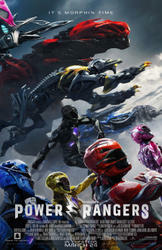 'Power Rangers' is back and it’s bigger & better than ever…but should your younger kids see it? Diane Mizota tells us why you might want to leave your little ones at home in this week’s Mom’s Movie Minute. Go, go Power Rangers! Dan Perrault visits the set of the new 'Power Rangers' movie and chats with the cast. Are you a teen who got bit by a radioactive turtle ? Have lots of homework after beating up bad guys? Or maybe you discovered the Batcave in your basement? Check out this video and discover how to be a teenage superhero! Looking for movie tickets? Enter your location to see which movie theaters are playing Power Rangers near you.